Home / Faith / Living faith / Holy Glory Batman, these geeks love Jesus! Joe Queen, as Green Arrow, speaks at a previous post-Comic Con church service at the Church at Rancho Bernardo. Joe Queen was well into his 20s when he began collecting Star Wars toys and other franchise memorabilia. The futuristic film, it seems, captured a key part of his past. Not long after entering his third decade, Queen attended his first Star Wars convention. In 2007, after moving to San Diego from his native Washington state, Queen attended Comic Con. “I never really thought of myself as a geek until the late 1990s,” the 44-year-old North County resident said. Four years ago, while serving in the Awana program at Church at Rancho Bernardo, Queen said he began conversations with various people in the congregation who also enjoyed pop culture and super heroes, a movement he calls traditional geek fandom. “I felt God calling me to start this ministry,” the probation officer said. 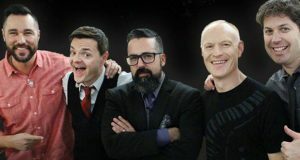 “If you look at most churches, there is not a ministry or a group to connect with the geek culture. Many geeks are introverts and feel awkward in social settings. I felt this is a community of people that I am a part of and love; and wanted to see them get to know and love Jesus and grow in their walk with Him. Queen teamed up with his friend Kevin Hicok, a fan of Green Lantern and Iron Man, to present the ministry idea to the small groups coordinator at CRB. After getting the green light Geeky Guys 4 God was born. Queen describes the ministry as a hybrid that focuses on truth, fellowship and service. Each Sunday church members leave donated bags of groceries by the bumper of their cars. “Then, my team will collect, count and store them at the church and a few days later they will be picked up by one of our local food banks to help feed the needy of our community,” he said. The ministry outreach has collected nearly 7,000 bags of groceries, more than 30 bags a week and probably enough to fill hundreds of telephone booths—an effort that would no doubt impress Captain America. To meet their fellowship goals, the ministry plans about six super hero movie events a year. The truth component comes through regular Bible studies that usually draw about 15 men. Last year their reach expanded with the launch of Geeky Gals 4 God under the direction of Nicole Edmonds. As many as 10 women participate weekly. To create another high-profile spin to the ministry, the group added a costuming element two years ago after Hicok’s wife Heidi, CRB’s children’s pastor, wanted to offer a Super Hero theme month in Sunday School. It’s now an annual tradition. Each week one of the Geeky Guys dresses as a Super Hero for the children’s services and students are also invited to wear their own costumes. The outreach events include a project with the Boy Scouts, Spooktacular, a Halloween military family gathering at Marine Corps Air Station Miramar, and the Awana Club’s Grand Prix event. The group’s most intensive outreach effort is at Comic Con, the largest super hero convention in the United States. Each year Comic Con draws about 130,000 people, many dressed in costumes. Tickets typically sell out within hours. Similar conventions have popped up across the country. Geeky Guys 4 God have passed out sunblock packets, bagels and water, as well as serving as ushers at the convention’s worship service. Last year they participated in two convention panels, one supporting the Christian Comic Arts Society. 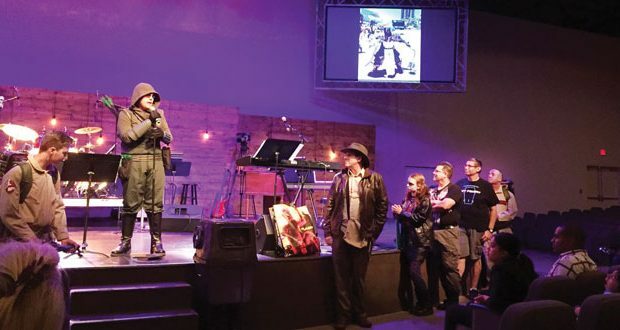 Each year the Rancho Bernardo church hosts a post-convention worship service featuring costumed ushers and a “Super Hero” message by one of the pastors. “The greatest (thing) is seeing the development of relationships between group members and seeing the personal growth in their walks with Jesus,” Queen said. “These are the best moments for me. That doubt ebbed, though, when his son, then a middle-schooler, begged to be included in the high-school-and-up ministry.